For seven years, Lord Garrett Sinclair– the ruggedly handsome illegitimate son of the Duke of Pembroke–has been traveling abroad with no intention of ever returning home to Pembroke Palace… until his father commands that he must marry by Christmas in order to thwart a family curse or lose his inheritance forever. Haunted by a tragic accident that has hardened his soul, Garrett entrusts his brothers to seek out a bride who will agree to a marriage in name only. Her reward? A sizable share of his inheritance–payable immediately after the wedding night…. Lady Anne Douglas has been ruined by scandal and disowned by her father. Facing a life of poverty and spinsterhood, she leaps at the generous terms of the marriage contract to ensure her independence. But the charade of a two-week engagement proves more of a challenge than either anticipated when they cannot resist the intoxicating lure of the marriage bed. Anne knows they will part ways after the wedding. Will she dare risk her heart for two weeks of pleasure in the arms of an irresistible rogue? 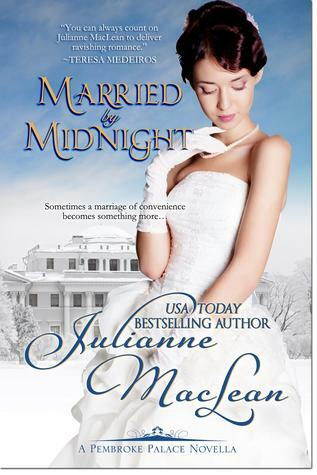 Or will her surrender become her undoing after a most unexpected turn of events mere hours before the wedding?